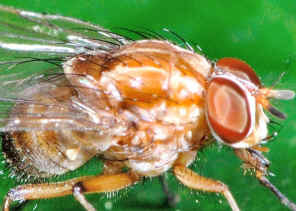 This page contains pictures and information about Muscid Flies and Bush Flies in Family Muscidae that we found in the Brisbane area, Queensland, Australia. 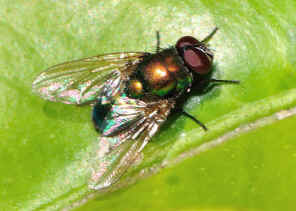 Flies in family Muscidae are either grey or metallic green in colours. They are small to medium in size. Those grey muscids have two stripes on their back. 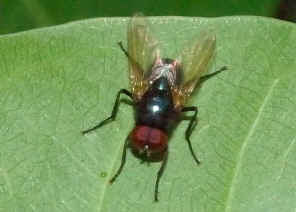 The Common House Fly Musca domestica is also in this family. 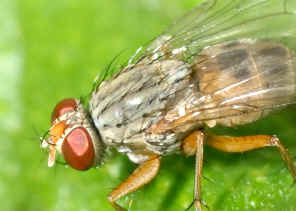 Adults are either blood or sweat feeders although a few of them are predators of other insects. 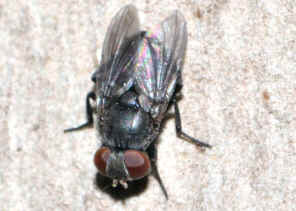 Most Bush Fly species develop as maggots in the animals dung, carrion or other decaying materials. 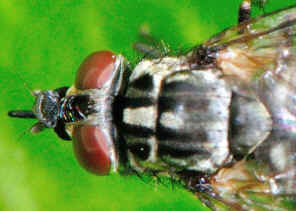 It is not easy to tell if it is a Muscid Fly for the diversity its body structure. 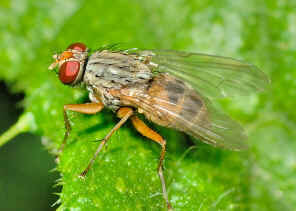 However, the combination of the following characteristic help to distinguish Muscid Flies from flies of other families. - vein CuA+1A not reaching the wing margin. 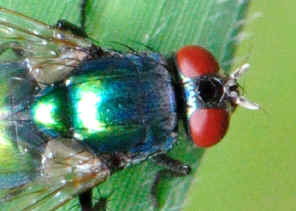 This small fly is bluish-black in colour with hairless eyes. The wing vein M is straight. The dorsocentrals (seta on thorax) is 2+4. Male is holoptic. 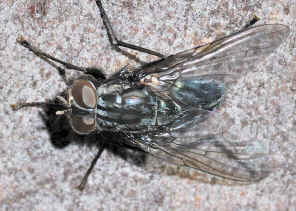 The legs are black in colour with pale tips to the tarsal segments. Mid tibia has a strong ventral seta. Wings are clear with veins on yellow. Please also check this page for more details. 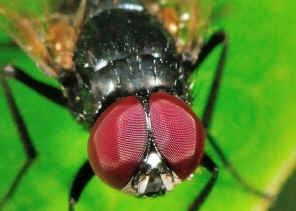 Flies in this group can be distinguished by wing vein M1+2 bent forwards with angle and reaching R4+5. They are either grey or metallic green in colours. 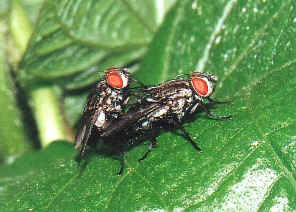 Common Bush Flies are grey in colour with two stripes on their back. Pictures were taken near Moolabin Creek in mid summer. Please also check this page for more information. 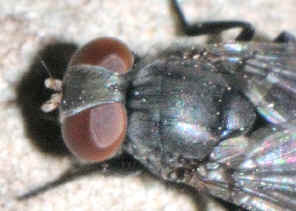 The fly has the grey thorax with dark grey vittae. 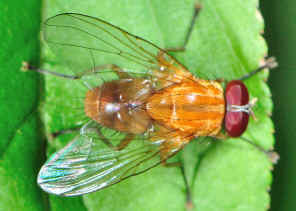 Wings are unmarked with brownish veins. Wing vein M1+2 bent forwards with angle and reaching R4+5. 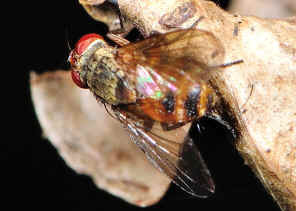 Abdomen is orange brown in colour with dark bands. please check this page for more information. 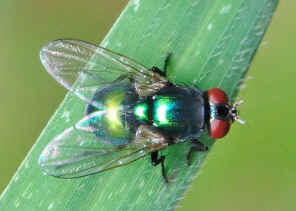 This green fly is medium in size and metallic green on colour. M1+2 strongly bent forwards but not angled. Mid tibia with a strong ventral seta. Please check this page for more information. 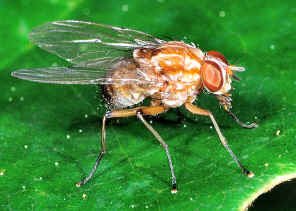 This little fly has wing vein M1+2 strongly bent forwards with angle and reaching R4+5. 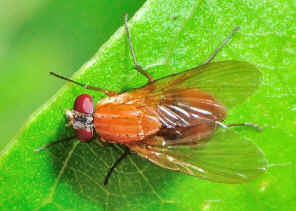 We believed is is the Neomyia sp. Please check this page for more information. 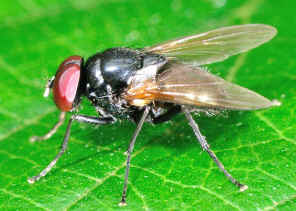 Stable Fly is a biting fly. 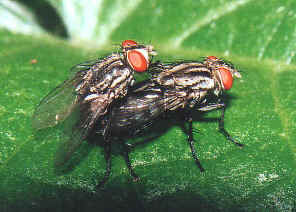 Stable Flies are blood sucking ectoparasites on mammals. They attack human, cattle, horse and other mammals. This is an introduced species and established around the world. Please check this page for more information. Flies in this group can be distinguished by wing vein M1+2 straight, although a few species have M1+2 bent forwards with angle and reaching R4+5. 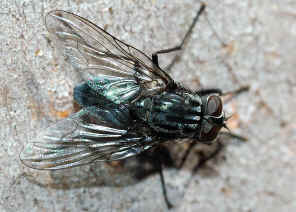 This Grey Bush Fly is medium in size. It is light grey in colours with red brown eyes. Its abdomen and legs are grey-yellow. 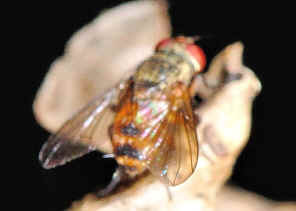 From its wing veins we believe it is a bush fly in Phaoniinae. Please check this page for more information. 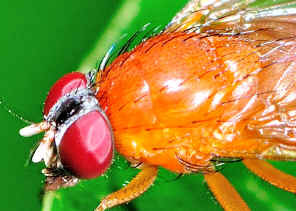 This is an Orange Bush Fly. 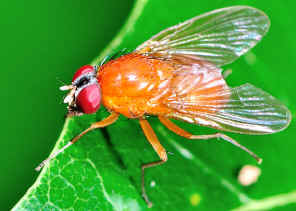 We call them Fat Orange Bush Flies because they have the broad bulky body. 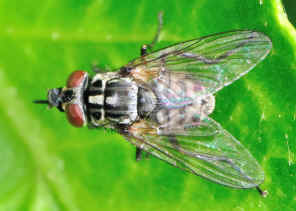 The scutellum is wide broader than long. They are quite common in Brisbane bushlands. Please check this page for more information. This Bush Fly is medium in size. It is orange brown in colours with red brown eyes. Its abdomen and legs are grey-yellow. 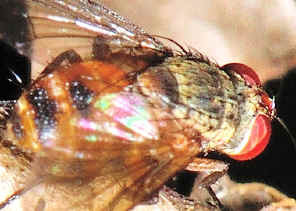 The scutellum is elongated. Wings are clear with vein M1+2 straight or slightly forwards at apex. Please check this page for more information. 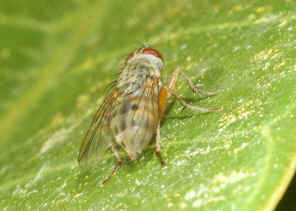 The fly is orange colour with whitish markings. Photos were taken in Brisbane Koala Bushland near Buhot Creek on July 2012. Please check this page for more information. 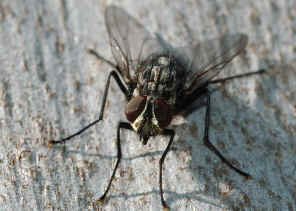 This Grey Bush Fly is medium in size. It is dark grey in colours with dark brown eyes. 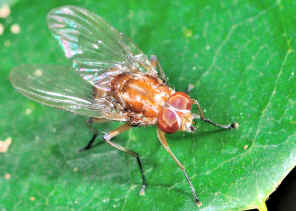 From its wing veins we believe it is a bush fly in Phaoniinae. Please check this page for more information. 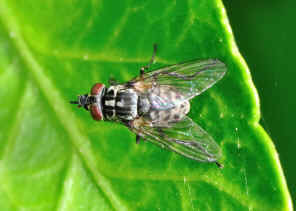 We saw this fly once and did not find any information on this fly. 1. Insects of Australia, CSIRO, Division of Entomology, Melbourne University Press, 2nd Edition 1991, p780. 2. Insects of Australia and New Zealand - R. J. Tillyard, Angus & Robertson, Ltd, Sydney, 1926, p375. 3. On the Fly, The Interactive Atlas and Key to Australian Fly Families CD Rom - Hamilton, J. et al. 2006. Brisbane : CBIT & ABRS. 4. 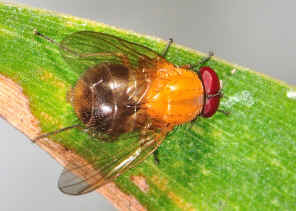 Family MUSCIDAE - Australian Biological Resources Study, Australian Faunal Directory. 5. Family Muscidae - By Adrian C. Pont, 2007. Australasian/Oceanian Diptera Catalog - Web Version. 8. Key to the Australasian and Oceanian genera of Muscidae (Diptera) - Márcia Souto Couri, Departamento de Entomologia, Museu Nacional, 20940-040 Rio de Janeiro-RJ, Brazil. 9. 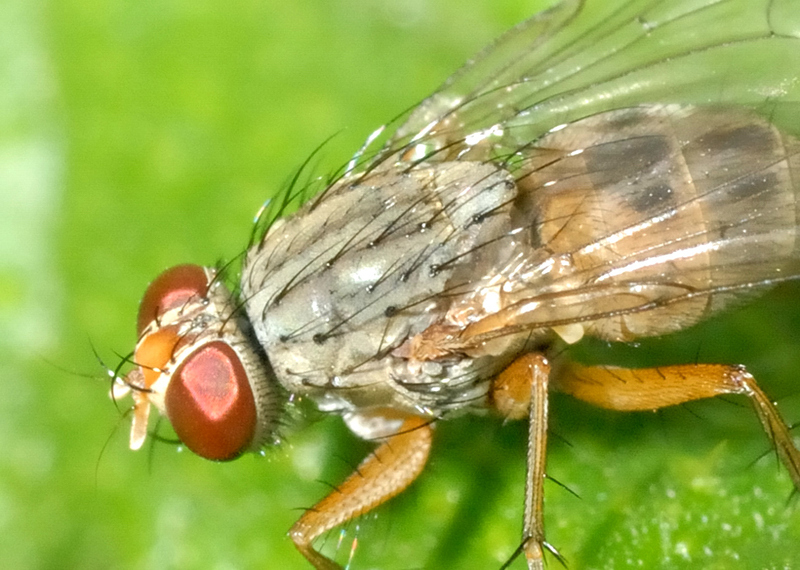 Studies on Australian Muscidae (Diptera). IV. A revision of the subfamilies Muscinae and Stomoxyinae - AC Pont, Australian Journal of Zoology Supplementary Series 21(21) 129 - 296, 1973. 10. 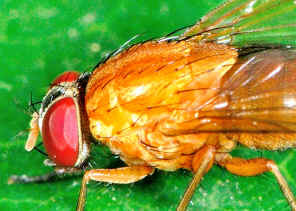 Studies on Australian Muscidae (Diptera) VII* .The Genus Atherigona Rondani - Adrian C. Pont, Aust. J. Zool., Suppl. Ser., 1986, No. 120, 1-90.